Saturday 10th June 2017 – A Busy day! Eleven Volunteers reported for duty today and there was much to be done. A great deal of snipping and clipping was required to keep the shrubbery in check and a good deal of weeding to try and keep the borders looking neat and tidy. The recent combination of wet weather and sunshine contributed to the speed with which mother nature is making her presence felt! Much of my morning was spent cracking the whip at Ben, who put his hand up for barrowing ballast from the end of platform 1 up to the location of the “Broadway Shed” behind the Pods. To give Ben his due, he always has a smile on his face! My main contribution was to point at the area where the ballast was to go! I did however, manage, in between loads, to repair the broken shiplap panels on the shed. Here is barrow load number 1 – only another 20(?) to go! I will be pleased to photo the final load. The one area that had benefitted from the rain was John’s vegetable patch. Potatoes, beans, onions and rhubarb are coming along nicely! Of course a pleasant and compulsory part of any volunteers day is to have a chinwag and put the world to rights (that would take some doing this week!) Here Mick and Andy discuss the finer points of 3 core cabling….. 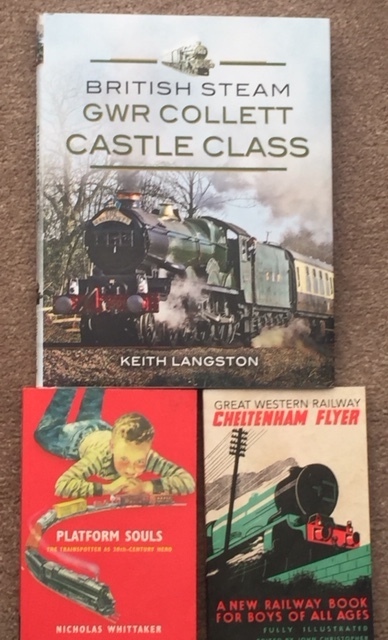 Finally my report finishes with a reminder to all Cheltenham bound passengers to call in by and look at the Friends of Racecourse Station’s stock of railway related items displayed in the fine and original Ticket Office at the top of the ramp, on platform 1. I’m sure something will catch your eye and all proceeds go to the ongoing maintenance of the Station. A belated report on yesterday’s activities and a few insights into others undertaken this morning. Yesterday Mick, Tim and I worked on the plumbing in of the new sink unit and cabinets in the worker’s cloak room that was mentioned in an earlier blog report. By the time I arrived yesterday morning it had been decided that we should “go for broke” and remove the old wash basin and pedestal and have the new sink unit as the one and only washing facility in the cloak room. Once the old facility had been removed the pressure was on to ensure that adequate “services” were available for operations today. Despite our best efforts we just could not achieve drip free joints on one of the supplies yesterday so with both a hot and one cold tap in operation we left the task for another non-operational day (probably Monday next). This morning more plumbing expertise was being requested as the Disabled toilet on Platform 1 was reported as being out of order. A quick look indicated that the pump unit in the cistern was showing its age, so I increased the water level in the cistern as a temporary measure and restored flushing operation for this weekend. Monday morning will see another visit to Screwfix for a new pump unit and a quick (is any plumbing task trouble free and quick ? anyway plumbing was not part of my electrical engineering degree course half a century ago! ) installation job before returning to the sink unit. The main task of the day was to tackle the rampant weed growth that is showing through despite my best efforts on Platform 2. This morning the now well germinated seedlings of the variety of long leaved prickly dandelions that infest part of the station were again sprayed as was a new crop of “mare’s tail” that has decided to take up residence on the edge of the trackbed. Though we are expecting a visit from the weed control train any day soon, the high winds have delayed their visit to the now weed infested area between the platforms, so a start was made controlling the new grass growth in the space between the new Platform 2 wall and the running line. Before the spray was exhausted I managed half the area, so we shall see in a week or so if success lies with the sprayer – or the weeds. Given our experience many years ago with eradicating the Bay Willow Herb between the platforms that took over 3 years of spraying to achieve success, I am not anticipating a quick win. Another small win was the successful translation of the plans for the Platform 1 building which have eluded me for many years. Brian Mason kindly lent me his CAD drawing of the building on a memory stick and a piece of free software downloaded from the internet has allowed us to now have a PDF version of Brian’s drawing for our archive. A small win that might come in useful when we need to think about the need for an extension to the existing building in the years to come as passenger numbers increase.